Dear agencies and CMOs: I’ll probably never know why so many brands try this ham-handed “what do you love about us?” approach, but unless your brand is one people are absolutely nuts about, they’d rather talk about themselves and their pets than talk about the many wonders of you. Sure, contests seem like an easy way into social media. But having created a few successful online contests over the past five years, I can tell you that actually pulling them off is not for the faint of heart, or the inexperienced. The two contests: For The Cutest Dog Competition, the online pet supply store, Dog.com and the relatively obscure premium dog food maker All-American Pet Brands, have teamed up to reach pet owners. And Proctor & Gamble’s Old Spice Brand has mounted a video contest to promote its Swagger Challenge to 18-25 year-old men. Both Old Spice Swagger and the Cutest Dog Competition provide weekly opportunities for people to enter. Both are praying for their contests to go viral, and were likely promised by their agencies that they would. Ok, I’m not a 18 to 25 year-old man, so I’m not the demographic for the Old Spice Deodorant’s Swagger contest. Nonetheless, I’ve never seen a more confused, obtuse, badly designed contest than the one that starts on this annoying page and gets weirder and harder to use from there. They’ve included their slickly produced commercials as examples, which rather, umm, stinks. The Cutest Puppy Competition, especially with huge cash prizes, appeals to every demographic and every dog owner has a favorite pet photo. But not every 18-25 year-old man is a skillful video producer. Especially not when the product is best name is best-known as an after-shave from many decades past. Something, ahem, old guys used to wear. The contest stakes are high, both for the entrants and P&G, who want to outsell AXE in men’s deodorant category, which reached more than $1.2 billion in sales in the United States last year. The domestic pet market is $34 billion a year, and growing fast. Dog.com and AAP Brands want their share. The grand prize in the Cutest Dog Competition is a cool million dollars. There are also a million dollars worth of other prizes during the 12 weeks of the contest. The Competition and the website are cleverly conceived, make excellent use of social media tools, and are easy to use. 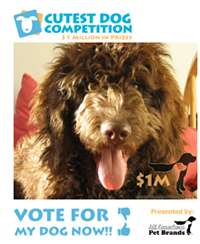 I entered Benny Bix Ochman Labradoodle in the Competition, and was immediately given a link to his contest entry page, plus the code to put his page on my blog, and a myriad of ways to solicit votes in dozens of social networks. (Please vote for Benny!) And since my dream is for Benny to work and me to be his manager, you can bet I want him to win. Old Spice has 20 challenges, ranging from make a video in which you “Spell Swagger on chests at game” to make a video of “the unveiling of a public street, avenue or boulevard that has been officially named “Old Spice Swagger”. There are 20 of these, but damned if I can find them all. Go ahead, see if you can figure it out, then come back. In fact, you don’t know from the homepage that there IS a contest because it just obnoxiously repeats “residue is evil”, but doesn’t say “Contest” anywhere I can find. You have to figure out that clicking on $$$$ in the nav bar will bring you to a hidden contest. Also partially hidden is the Old Spice name. Go figure! Cutest Dog Competition – take a picture of your dog, upload it, ask your friends to vote for your dog. A new contest every week for 12 weeks. Final decision on Thanksgiving Day, despite the fact that many people will not be online during that national holiday. Old Spice: you have to download a PDF!!! to see the rules and instructions – and it takes several clicks to get to it. Hello! Nobody wants to download a PDF to find out how to enter a contest! The Swagger challenges change at unspecified intervals and several go on simultaneously. Each challenge has its own PDF and one has to click through several pages to get to the details of each challenge. Cutest Dog Competition: Contest and rules are clearly explained, step-by-step on the homepage. Each person can enter each week, and can vote for him or herself every day and get their friends, family, and social network followers to do the same. Old Spice “The judges’ favorite entry wins.” How Web 1.0 is that?! And while they may be listed somewhere in the incredibly small type, I sure couldn’t find the judges name or an explanation of why they’re more qualified to judge than the public. Cutest Dog Competition: “Top 4 finalists will be chosen by the public from the 12 weekly semi-finalist winners” and the judges are shown on the homepage. I couldn’t find their bios, however. Old Spice Blog is not a blog at all, except that comments are accepted. Oddly tagged as “Man Thoughts” in a drop down graphic, it’s actually a list of press mentions of the contest. Like the rest of the site, it seems to have been created by a committee, perhaps consisting of a variety of agencies.They also threw in some stuff about car racing. Cutest Dog Competition Blog is about the contest. In a recent post, they note that the site is so busy they are doubling the speed and capacity of the servers. You can be sure that neither of these contests was cheap to produce. And that people will go to great lengths to win a lot of money – especially $1 million. But the vast majority of user-generated video are awful, and watching a whole lot of them can be stultifying. The Cutest Dog Competition’s call for photos makes it easy to show them in a gallery. And, as co-founder of Pawfun.com, where people upload and decorate photos of their pets for us to print on a variety of personalized products, I can tell you that even the worst photographer can take a cute picture of a pet. Despite the fact that social media has been on the landscape – and there are case studies of major successes (from the Subservient Chicken to the Firefox video contest) for more than a decade, we are still in the earliest stages of corporate experimentation. As if waking from a huge collective nap, companies large and small are rushing to get into the social media game. Many jumped in as the economy forced budgets down, falling for the myth that social media is free, or at least cheap. And for the idea that any of the tens of thousands of self-proclaimed, no-client social media gurus to produce a successful social media strategy. Ironically, the biggest companies, like P&G, with huge resources available, are often the least facile. Sooner or later, they’ll realize that communication has actually, really, truly changed. And that there really are new rules that put the customer in charge. And at some point, these still-young-Internet days will one day seem as primitive as the first days of television. I sure hope that’ll be soon. – The Formula for Successful Viral Campaigns. Not! I voted for Benny! He is totally worthy of a cute vote. I’d like to wait a month and see who draws in higher traffic. Though I do agree with your analysis about the sites and the style of the contests. This is an awesome post. Social Media is one of the best marketing ways i guess.